A scientific study posits that the beautiful rings surrounding the planet Saturn were actually created from the death throes of an ancient moon. 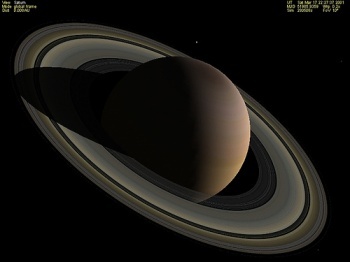 The origin of Saturn's rings has been a mystery for a long time. At first, astronomers believed that the rings were debris created when two of Saturn's many moons collided and showered bits of rock and ice into the outer atmosphere of the fifth planet in our solar system. But, as our probes gather more information about the makeup of Saturn's moons, the evidence didn't match up. The rings are almost 95 percent ice, while the moons are half rock and half ice. If the rings were made from a collision, then what happened to all of the rock debris? A new study written by Dr. Robin Canup, from the Southwest Research Institute, and published in the scientific journal Nature puts forth the theory that a large moon, bigger than Saturn's Titan, fell out of orbit slowly with gravity pulling off the layers of ice before the rocky center hit the surface. The ice stayed in orbit and formed the rings that we all recognize. Canup's theory begins with the formation of the planets in our solar system. Billions of years ago, around each of the major planets was a disc of hydrogen and other elements that eventually coalesced into solid moons. Some of these would have fallen into Saturn, while the orbits of others could have degenerated over 10,000 years, leaving behind the rings. This would also explain some of Saturn's smaller moons which may have formed from ring materials. Other experts are happy with the new theory. Larry Esposito, an astronomer from the University of Colorado said that it was "a very clever, original idea," and that he was interested in the idea that moons formed from the rings. "I would call it more like cosmic recycling," Esposito said. "It's not so much a final demise, but a cosmic effort to reuse materials again and again."